Cowboys are a true piece of American history, rooting all the way back to the Wild West and uncharted frontier. If you are a real-life cowboy and need a great pair of boots specifically designed for riding horses and guiding cattle, you can’t choose just any boots. You need a rugged pair of boots that are tough and built to last no matter the weather elements. Having a pair of quality cowboy boots can keep your toes safe from stomping horses and cattle, and keep your extremities warm during frigid temperatures. Cowboys never rest and you need a solid pair of cowboy boots that won’t either. When you are buying cowboy boots you can’t just settle for the cheapest pair or the ones that look the most stylish. In fact, there are certain criteria that must be considered when purchasing cowboy boots. The first of which is the material they are constructed from. Traditional leather boots are durable and stylish, but this requires more maintenance. For true style, you can also get alligator or snakeskin boots. Fit is also extremely important in cowboy boots, which is why they really need to be tried on. You will want to make sure there is proper cushion, support, and arch support. Making sure they fit well with the socks you normally wear and that there is no pinching in the toe area is also important. Finally, determining whether or not you want spurs, waterproof capabilities, and scent control features is also important. Now that you know what to look for in the best cowboy boots, it’s time to start your search process. The following 10 boots range in brands from Corral to Ariat, but all are made of quality materials and have what it takes to top the list of best cowboy boots. 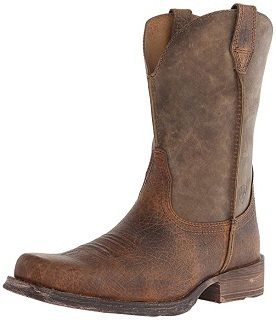 If you are looking for a high-quality pair of cowboy boots, the Ariat Men’s Rambler Wide Square Toe Western Cowboy Boot is definitely an option to consider. These boots are certainly not cheap, but you get what you pay for. These riding boots are worn by professional athletes and that’s because they are high-grade and extremely functional. 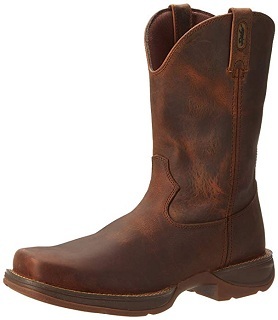 The Ariat Men’s Rambler Wide Square Toe Western Cowboy Boot comes with an 11-inch shaft and is made from durable leather. Their Duratread outsole provides strong traction with the ATS technology composite fiber gel-cushioned insole ensures that you’re comfortable when on your feet. In addition, they also have a built-in moisture-wicking feature that prevents your feet from becoming wet and sweaty. These boots might seem on the higher end in terms of pricing, but they will last you decades. When it comes to finding a quality, durable pair of riding boots fit for a cowboy, the Ariat Men’s Rambler Wide Square Toe Western Cowboy Boot must be on your list to consider. Cowboy boots don’t always have to be for work, sometimes you want them to make a statement. 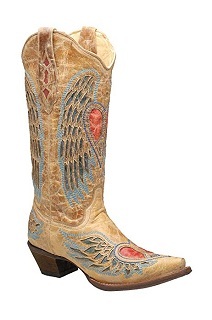 Fortunately, the Corral Women’s Heart Angel Wing Cowgirl Western Bootexists to add some flair to the cowboy boot game. These women’s designer cowboy boots come with a distressed antique saddle goatskin featuring a red leather inlay peace heart detail. They truly have a unique design that you will not find anywhere else. In addition to a fashionable flair, the Corral Women’s Heart Angel Wing Cowgirl Western Boot is also extremely comfortable. The 13” scalloped shaft fits the calf comfortable and the snip toe silhouette gives you plenty of room in the toe box. Plus, the red leather pull straps make it easy to slip these boots on and off. The price tag may scare some people off, but these boots are handcrafted and are sure to make a statement. For the most fashionable women’s cowboy boots on the market, the Corral Women’s Heart Angel Wing Cowgirl Western Boot must be considered. 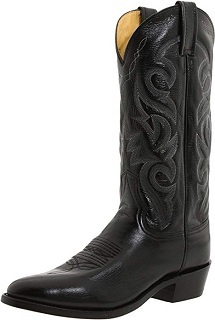 Ariat is a great brand name when it comes to cowboy boots and the Ariat Men’s Heritage Roper Western Cowboy Boot certainly do not stray from that thought. These cowboy boots are durable and built to last with a quality full-grain leather upper and they are also leather lined to provide a comfortable fit. Not only do the fit comfortable with a 1.5” low roper heel, round roper toe, and 10.75” shaft, but they are also extremely lightweight so you can wear them comfortably all day long. The Ariat Men’s Heritage Roper Western Cowboy Boot also feature ATS Technology which provides cushioning and flexibility that other boots simply cannot match. This makes them great for time spent in the saddle or on the ground because they reduce stress and fatigue in your feet, legs, and back. Plus, with removable gel-cushioned ATS insoles, you can rest assured you’ll be comfortable all day long. For comfortable and affordable cowboy boots, the Ariat Men’s Heritage Roper Western Cowboy Boot should be on your list to consider. If you are looking for a simple pair of quality cowboy boots, theOld West Men’s 13” Black Cowboy Work Boot is one that tops the list. This all leather cowboy boot is versatile enough to hang through a tough day in the fields before being dusted off and worn out on the town. The 13” shaft will keep your legs protected and comfortable all day long and the touch rubber outsole is designed for slip resistance. In addition, the Old West Men’s 13” Black Cowboy Work Boot also features reinforced shanks for more support during those long days and nights. The Old West Men’s 13” Black Cowboy Work Boot is not just quality work boots, but they are also fashionable and comfortable. The narrow round toe fits most feel feet and the cushioned insole absorbs impact to reduce stress and pain on your feet, lower legs, and back. For a quality pair of leather cowboy boots that can be worn to work or for a night out, take a look at the Old West Men’s 13” Black Cowboy Work Boot. For a bit more flair in your work boot, the Durango Men’s Rebel DB5444 Western Boot should be on your short list to consider. These boots feature a two-tone variance that gives them a sleek design. These boots are also lightweight and come from the quality Durango name. Made from quality SPR leather, the Durango Men’s Rebel DB5444 Western Boot is durable and built to last. 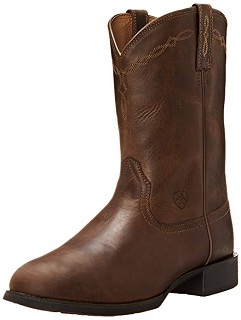 In addition to everything listed above, the Durango Men’s Rebel DB5444 Western Boot is also extremely comfortable. With comfort core insole technology, these boots are great for even the longest days of work. The circle cut outs also aid the pull-on process so you can be up and out the door in just seconds. For high-quality and durable cowboy boots that feature a stylish design, don’t overlook the Durango Men’s Rebel DB5444 Western Boot. For the best kid’s cowboy boots on the market, you’ll be hard pressed to find a better brand than Smoky Mountain. That’s because they make great cowboy boots for kids and the Kids Child Denver Leather Western Boot is no exception. These boots come in a variety of colors and sizes and feature a full-grain leather. With a variety of designs and embroidered patterns, the Kids Child Denver Leather Western Boot has an option for everyone. In addition, these boots feature a round toe for added comfort and rubber outsoles to offer better traction and keep them from slipping. With pull tabs to make slipping them on and off easier and cushion insoles, these cowboy boots can be worn comfortably for extended periods of time. Plus, they have a wide fit so you can find a perfect size even for kids with wider feet. For comfortable and stylish cowboy boots for kids that you can afford, consider the Kids Child Denver Leather Western Boot. You might think of rugged men when you think of cowboy boots, but that’s a vision from the past. Cowboy boots can also be for children and the Smoky Mountain Children’s Monterey Western Cowboy Boots are exactly the boots for the little cowgirl or cowboy in your life. 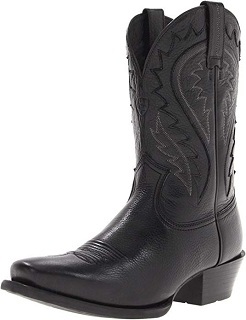 These cowboy boots have a walking heel and are made in a classic western design. The Smoky Mountain Children’s Monterey Western Cowboy Boots also feature a synthetic lining for added comfort so you know your little cowboy or cowgirl is ready for whatever comes their way. 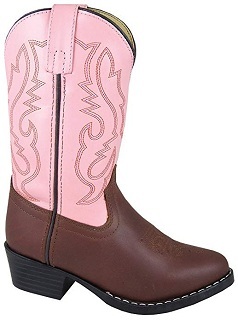 In addition, the Smoky Mountain Children’s Monterey Western Cowboy Boots is designed to fit a child’s foot perfectly and come in a variety of colors and sizes. Plus, the durable outsole provides slip resistance to keep them safe. For the best cowboy boots for children, the Smoky Mountain Children’s Monterey Western Cowboy Boots should certainly be a pair to consider. If you are looking for a pair of truly stylish cowboy boots great for a night out on the town, the Laredo Men’s McComb Western Boot is one to consider. These boots feature a 13” leather-like shaft and a leather foot. Not only are they stylish in a brown design with some embellishments, but the Laredo Men’s McComb Western Boots are also comfortable. They come with a comfort insole that is great for even the longest of days spent on your feet. Plus, the Laredo Men’s McComb Western Boot also comes with a neoprene outsole. That means they are oil and slip resistant so you can wear them safely. 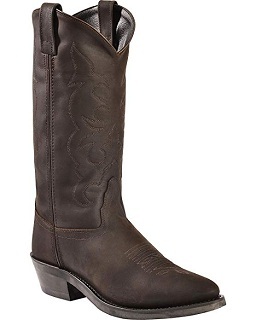 With a 1 5/8” cowboy heel and a medium round toe, you can also rest assured that these cowboy boots will fit nicely. For stylish boots that can also function well for a day out riding and working, you should definitely consider the Laredo Men’s McComb Western Boot. 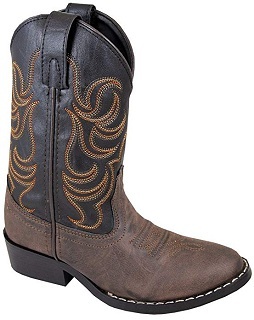 If you are searching for a high-quality pair of cowboy boots, you should definitely take a look at the Ariat Men’s Legend Phoenix Western Cowboy Boot. One of the great things about these boots is that they come in a variety of colors so you choose the one that fits your preference best. Plus, these boots are built to last and have a four-row stitch pattern that gives them an added flair. In addition to everything listed above, the Ariat Men’s Legend Phoenix Western Cowboy Boot is also extremely comfortable. The square-toe profile offers a more comfortable design and the rubber outsole provides traction and slip resistance, which is essential for riding and work boots. As far as comfortable and durable riding boots go, the Ariat Men’s Legend Phoenix Western Cowboy Boot certainly sit towards the top of the list. Plus, these boots are more affordable than many others on the market! If you are at all aware of cowboy boots, you’ll likely know the Dan Post brand name. It’s a popular brand that stands for quality and the Dan Post Men’s Milwaukee 13″ Western Boot certainly fits the bill. 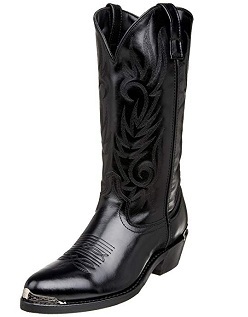 These cowboy boots are made from quality and durable leather and also features elaborate stitching up the shaft. Plus, there are a variety of different colors available so you can choose the design that suits you best. In addition to being stylish and durable, the Dan Post Men’s Milwaukee 13″ Western Bootis also practical. They have stacked heels and dual pull tabs to make it easier to slip into them. The Dan Post Men’s Milwaukee 13″ Western Boot also has a comfort cushion insole and padded footbed so even during the longest of work days your feel will be stress-free. The higher price tag might scare some people away, but the Dan Post Men’s Milwaukee 13″ Western Boot is stylish, quality, and comfortable. This is a cowboy boot that you simply cannot overlook. 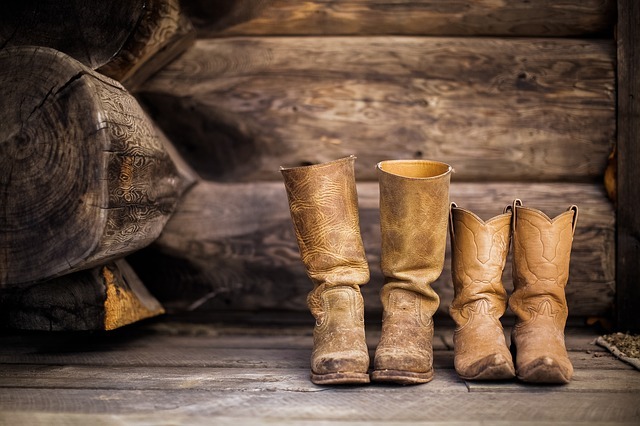 Now that you have the lowdown on the top cowboy boots on the market and what to look for when buying cowboy boots, which pair seems like the best fit for you? Are you looking for a quality pair of stylish boots or do you want a great pair of riding boots? All of the boots on this list certainly rank high on the list of top cowboy boots, but the final decision really comes down to your budget, style preferences, and the key features you are looking for in cowboy boots.